Please find below a link to a PDF file with some common FAQ’s on. Please feel free to print this out for display. 14th & 15th March – Event City, Manchester, M17 8AS. Find us on stand number J76. 25th & 26th April – Westpoint Centre, Exeter, EX5 1DJ. Find us on stand number H78. 23rd & 24th May – Yorkshire Event Centre, Harrogate, HG2 8NZ. Find us on stand number F140. 19th & 20th September – Ricoh Arena, Coventry, CV6 6GE. Find us on stand number C33. 7th & 8th November – Sandown Park, KT10 9AJ. Find us on stand number I3. Recently introduced standards put equal importance on protecting the electrical installation and electrical equipment as well as the building itself. This focus is because modern electronic components are very small and sensitive to over-voltages. As technology increases, consumer’s demand that the electrical items we use get smaller, which means the components inside are also smaller. The reduction in the size of these components over the years now makes electronic equipment so sensitive to over-voltages. An over-voltage, or a surge as they are generally called are short spikes in voltage, which unknown to most people are occurring all the time. As the components inside the electrical equipment we use are so small they are slowly degraded by these surges, which gradually shorten the lifespan of the equipment. This phenomenon affects everything that is plugged in to power, from your household electronics through to industrial machinery and computers. Many computer systems are now networked and they rely on each other to operate. If one part of the system gets damaged due to lightning or surges, the whole system will not operate. The consequential losses suffered during such events i.e. downtime and lost production, can be very high. A Type 1+2+3 combined lightning and surge device must be installed if the building is fed by over-head lines or it has an external lightning protection system. When lightning hits the external lightning protection system (or over-head power lines) the lightning travels down the cable to the main incomer of the building. Although the external lightning protection system is earthed, only 50% of the total voltage from a lightning strike will go to earth, the other 50% (possibly up to 100kA) will travel across the cross-bond on to the incoming panel and out onto the electrical circuits in the installation. This creates a massive risk to the property and to any life inside. The Type 1+2+3 combined lightning and surge device is usually fitted in a separate enclosure and mounted next to the main board. They are wired in parallel to the supply, and can either be fed directly from an existing breaker in the board, or you can install connection blocks off the main board and wire the device into these connection blocks. If the building has sub-distribution boards more than 10 metres away from the incoming panel, these boards will require additional protection. A Type 2 device is usually sufficient here, unless the panels / sub-distribution boards feed external circuits such as car park lighting, CCTV etc. then these should have a combined Type 1+2+3 device fitted as standard. In all other installations, where the building does not have an external lightning protection system and is fed by underground cable then a Type 2 surge arrester is sufficient. This Type 2 device can sit on the main board, where it will protect all outgoing circuits. If there are any sub-distribution boards 10 metres away from the main board then these will also need protecting with a Type 2 device. The reason for this is because surges can occur from anywhere in a building. Usually we think about the surges coming in from the mains, but generally this is not the case. Only about 20% of surges occur from outside the building. Whereas 80% of surges are generated from within the building, due to things like switching events. Surge Protection is required to be installed under the 18th edition guidelines from January 2019. This is because the surges that have always occurred in our systems now pose a threat due to the increasing use of more sophisticated electrical equipment. As you can imagine, the equipment we use everyday is getting more technical, but also smaller. Which means that the components inside are getting smaller, so more susceptible to damage from any over voltage. The 18th edition states the only instance surge protection may not be installed in a domestic situation is if the value of the surge protection device exceeds the value of the electrical installation or a risk assessment has been carried out to prove the property does not require protection. Most modern and the latest designed Type 1+2+3 combined lightning and surge arresters will have common and differential mode protection (all mode arresters). This means that these new devices protect not only from phase to earth and neutral to earth, but also phase to neutral and phase to phase. The advantage of an all mode arrester is a very low let through voltage between all conductors, less than 600V. A device of this type will be able to handle direct lightning currents as well as protect sensitive electronic equipment from damages up to 10 metres away. 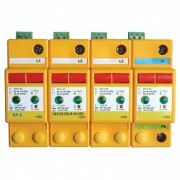 Type 2 devices commonly referred to as surge arresters are generally fitted at the sub-distribution board position. They take out of the system internal surges from switching events, which can damage sensitive electronic equipment. Any sub-distribution board more then 10 metres away from the arrester at the main incoming position should have a Type 2 device fitted. They have visual indication of status and should be checked regularly to see if they remain active. Type 3 arresters are generally fitted to stand alone pieces of end equipment fed from sockets but not exclusively e.g. a fire alarm panel more than 10 metres away from a sub-distribution board, which has a Type 2 surge protection device fitted. If you have been keeping an eye on our Facebook page recently, you will have seen we did a interesting fact a day for 10 days. All the 10 facts can be found here within this post. While the flashes we see as a result of a lightning strike travel at the speed of light (670,000,000 mph) an actual lightning strike travels comparatively gentile 270,000 mph. This means it would take about 55 minutes to travel to the moon, or around 1.5 seconds to get from London to Bristol. 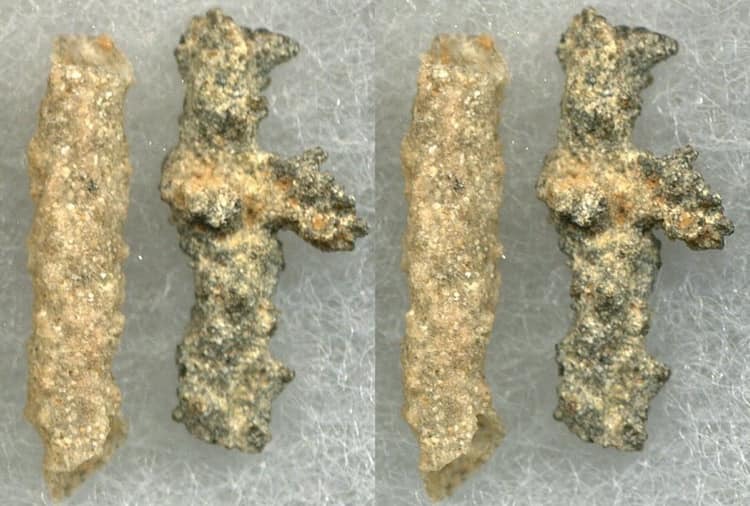 When lightning strikes sand or sandy soil, it fuses together the grains to create a small glass-like tube known as fulgurite. They are not only prized by collectors, they are also of great scientific value in demonstrating past occurrence of lightning storms. Lake Maracaibo in Venezuela is the place on Earth that receives the most lightning strikes. Massive thunderstorms occur on 140-160 nights per year with an average of 28 lightning strikes per minute lasting up to 10 hours at a time. That’s as many as 40,000 lightning strikes in one night! 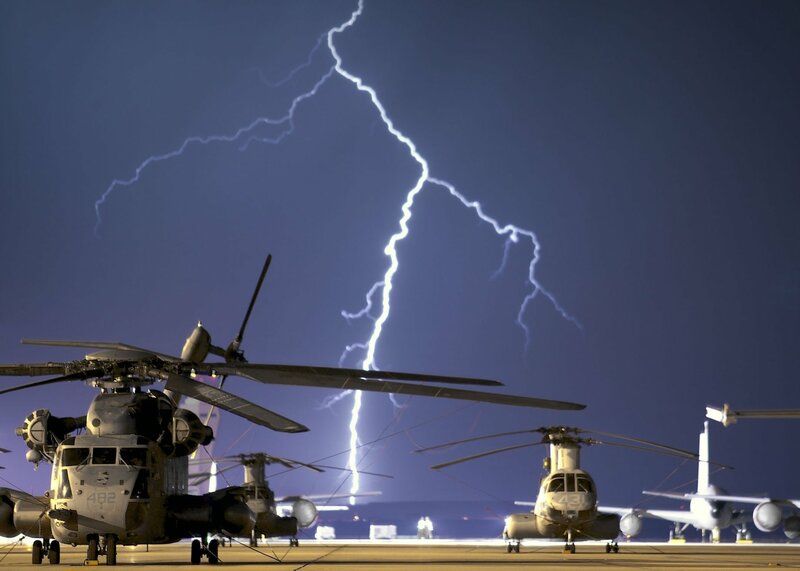 Recent research from the Met Office revealed that helicopters can cause an isolated lightning strike. 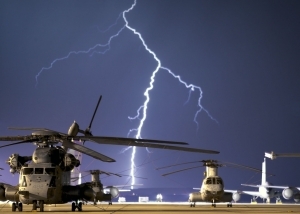 While flying, the helicopter acquires a negative charge, so if it flies close to an area that is positively charged (e.g. hail or the base of a cumulonimbus cloud) it can trigger a lightning strike. Lightning is one of nature’s most recurrent and common spectacles. 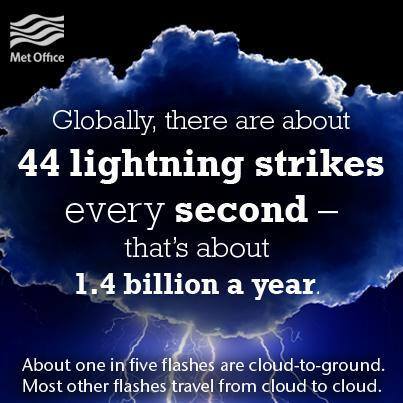 Around the world, there are over 3,000,000 flashes every day. That’s around 44 strikes every second. Trees can often be destroyed by lightning strikes. When lightning hits a tree, it usually travels just below the tree’s bark where there is a layer of sap and water. 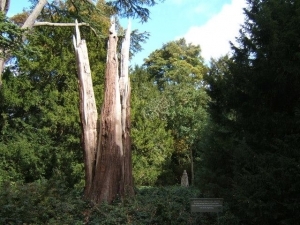 This layer becomes instantly heated and expands causing the bark to be blasted off the tree and sometimes splitting the wood. While nitrogen is in the air all around us, for plants to be able to absorb it (a process vital for their growth) they rely on a process called Nitrogen fixation. 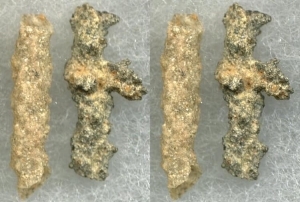 Although much of this process is done by bacteria and algae, the extreme heat of a lightning strike causes nitrogen to bond with oxygen to create nitrogen oxides which combine with moisture in the air to fall as rain and water plants with nitrate-rich water. 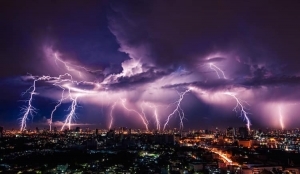 While the intensity of a lightning strike can make them appear as thick bolts across the sky, the actual width of a lightning bolt is only about 2-3 cm. The average length of a lightning bolt is about 2-3 miles. The charge carried down this small channel is so intense that the temperature of the lightning reaches 30,000 °C – that’s five times hotter than the surface of the Sun. While lightning storms are impressive in their own right, they don’t quite compare to the spectacle when volcanic eruptions trigger lightning strikes. 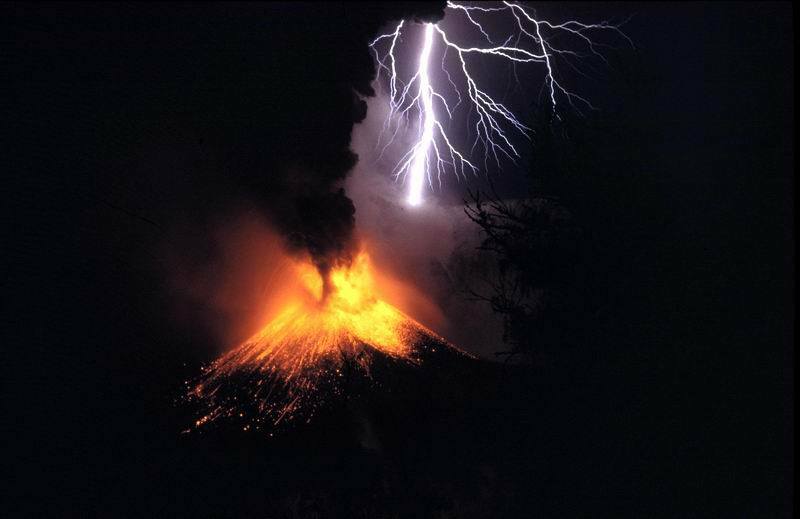 When an eruption occurs, earth and ash are thrown into the air in a giant plume, colliding to create an electrical charge. In the same way as normal lightning, the imbalance between the plume’s electrical charge and the charge in the atmosphere leads to lightning strikes. To tell how far away a thunderstorm is, simply count the number of seconds between the flash of lightning and the boom of thunder that follows. Divide this number by five and this tells you how many miles away you are from the storm (or divide by three for the distance in kilometres). Did you know, until the late 18th century it was believed that ringing church bells repelled lightning so many church bells bore the inscription fulgura frango, meaning ‘I chase lightning’. During a thunderstorm, bell ringers would run to the bell tower to ring the bells. However, a high tower with a metal bell was in fact about the worst place to be. Between 1753 and 1786 in France, 103 bell-ringers were struck by lightning and killed, resulting in the custom being banned. 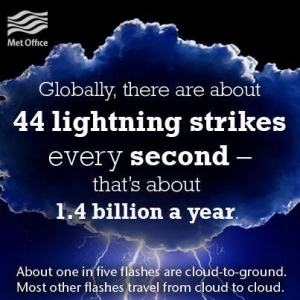 We hope you enjoyed the fun facts about Lightning. Watch out for more information coming soon to our Facebook page and on our website. These facts are available from The Met Office. This is a question that will crop up quite a lot this year, especially as Surge Protection gains popularity through the 18th edition of the wiring regulations. We have been asked time and time again over the years about whether contractors are allowed to install our Surge Protection Device into a traditional manufacturers mains unit. We hope this short blog article will clear things up for you. Most consumer unit manufacturers, quite rightly, won’t guarantee their boards if another manufacturers MCB’s or RCBO’s are fitted inside it. 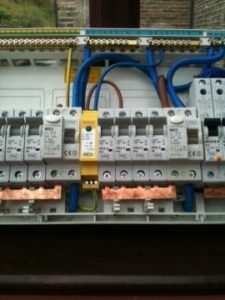 This is generally because the MCB’s are specifically designed to align with their own unique busbar systems and a badly fitting MCB might create a hot spot with a poorly aligned busbar connection. 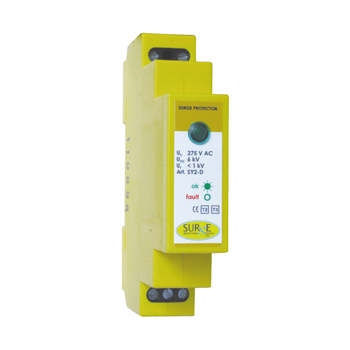 However, a free standing din-rail mounted device, such as a surge arrester or timer etc. is not connected to the busbar system, it is only wired by the installer with cables, therefore such problems can’t exist. 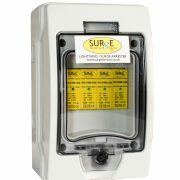 If the consumer unit manufacturer insists you use their own surge arrerster, this is purely for commercial reasons, as the installer you can decide to fit our surge arrester in any manufacturers board and we will guarantee it for 10 years. Or you can fit our surge arrester in a separate enclosure directly adjacent to the consumer unit. Even with the separate enclosure added, our prices will still be well below the cost of a surge arrester from the traditional manufacturers. If you would like any more info on this matter please call our dedicated team on 01484 851 747. This month we will be focusing on how to sell a domestic surge arrester. I wanted to start with the domestic market as it is generally more difficult to sell a domestic surge arrester than it is one for a commercial or industrial installation. With a domestic installation according to the Regs it is only a recommendation that surge protection is installed, it’s not mandatory. So why do we need to fit them? I hear you all say. Well, its actually really simple… Every single household nowadays has some form of electrical equipment inside, whether this be just a kettle, microwave and a TV or on a much bigger scale, cinema room, LED lights and electronic gates, everybody has something of value to them that could potentially be destroyed by the effects of surges. A lot of people know and use the trailing leads to protect 2-3 pieces of equipment, like a PC, laptop or a TV for example. These trailing leads only protect a few pieces of equipment at a time, unless you plug them into every socket in your house, which then gets very costly and looks messy. It is also impossible to fit them behind kitchen units to protect washing machines and tumble dryer’s. The only way around this dilemma is to buy and install a domestic surge arrester like our SY2DLED (pictured below). This compact device combines double pole protection in a single module unit, which is easier to install in a domestic situation. It has an LED light on the front, which is a requirement of the Regs that all surge protection devices should have visual indication. Once this light goes out its time to replace the device, but these will typically last 10-11 years. To install the SY2DLED into a consumer unit just clip it onto the din rail or mount it in an enclosure and connect the device in parallel across the board. From the bottom of the device take an earth wire up to the earth bar. From the top of the device take a neutral wire up to the neutral bar. Also from the top of the device take a live connection to an adjacent breaker that’s already in the board. And there you have it, your surge device is installed and ready to start protecting your electrical items. So how do I sell one of these to my customers? Like I said before this is the tricky bit, as it’s not mandatory. I usually start by asking the customer what electrical items they have in their own home and asking them to add up in their head roughly what its all worth. The trade list price is £70.55 and they typically last 10 years. This equates to roughly £7 per year to protect all your electrical items in your house. It will even protect your mobile phone when you plug it in at night to charge it. Plugging any piece of electrical equipment in without protecting it makes it susceptible to damage caused by surges. Because technology is getting smaller but faster and more complex the manufacturers are using smaller micro-components, which are extremely sensitive to surges. When a piece of electrical equipment sees a surge it prematurely degrades the micro-components, so the piece of equipment wont last as long as it should. This particular surge device is a perfect add on to those purchasing consumer units for re-wires or a new board fitting. We are very competitively priced and provide outstanding technical knowledge as well as offering FREE site surveys. If you would like to know more about Lightning & Surges, how to protect your sensitive electrical equipment or learn more about how to sell surge protection then please get in touch with us and we can arrange a staff training session completely FREE of charge. You can either email me at helen@surgedevices.co.uk or call me on 07969919161 to book the training. Last week we discussed lightning protection being mandatory if the building is fed by over-head lines or it has external lightning protection. To follow on from that, in this week’s blog we will be talking about a specific device, the 10651/LED. For those that missed our last blog, here’s a quick re-cap on why Lightning protection is installed. When lightning hits external lightning protection (or over-head power lines) the lighting travels down the cable to the main incomer of a building. Although external lightning protection is earthed, only 50% of the total voltage from a lightning strike will go to earth and the other 50% (possibly up to 100Ka) will travel across the cross-bond on to the incoming panel and out on to the electrical circuits in the installation. This creates a massive risk to the property and to any life inside. The 10651/LED is a three-phase lightning and surge combined device. This means that it not only protects against lightning strikes, it will also take any surges out of the electrical system. The 10651/LED is a large device (about 8 module width), which contains all the necessary components to ensure that the electrical system is safe from over-voltages and lightning strikes. As we discussed last week, the lightning will travel down the copper tape (or over-head cable) and on to your distribution board. With the 10651/LED being so big, it is usually mounted in to an enclosure next to the main panel. When the device detects the spike in the system (whether Lightning or a surge), it directs the spike down to earth and re-sets itself. This device works in about 25ms, which is much faster that the RCD will detect anything, meaning that the breakers wont trip and the electrical supply will continue un-interrupted. As I previously mentioned, the 10651/LED is very large and usually is mounted in an enclosure next to the board, this needs to fit as close to the main switch as possible. From an existing three-phase breaker in the board, take your live cables in to the top of the device. Take a neutral cable from your neutral bar to the neutral terminal on the top of the device. Finally take an earth connection from the earth bar to the bottom of the device, for this connection the cable needs to be less than 50cm in length. Check out the 10651/LED here. If you need any advise about which device you need, please use the contact form or call us in the office on 01484 581747.